CD Genomics provides statistical and bioinformatic data analysis services that help our customers to explain large amounts of data that generated by sequencing, genotyping, and microarray experiments. Next-generation sequencing has fundamentally revolutionized biological and medical sciences. A sequencing/microarray data analysis project requires careful planning, seasoned methodology, and concise reporting. CD genomics is an expert company offering comprehensive bioinformatics solutions in all aspects of sequencing and microarray. We provide data analysis service for data generated by a wide range of sequencing/microarray platforms. 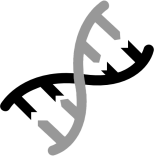 We use the cutting-edge bioinformatics algorithms and pipeline, and provide you with high-quality and ready-for-publication figures. Our bioinformatic staff consist of PhD-level scientists trained in computer languages, statistics, bioinformatics, genetics, and genomics. 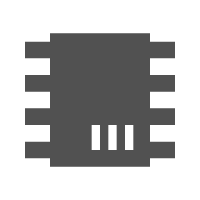 The software infrastructure for analysis is a combination of custom-built and open-source software. Our bioinformatics services take your raw next/third generation data and provide you with comprehensive figures customized to your research purposes as well as personalized data interpretation support. 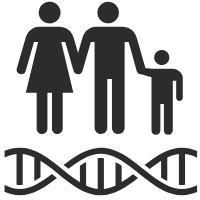 CD Genomics’ full range of bioinformatics services can be an ideal solution for you. High-throughput sequencing technology can generate numerous data with heterogeneous quality, and there is no optimal bioinformatics pipeline for all cases. We are specialized in customizing the bioinformatics pipeline for your specific projects. We support companies and research groups by turning ideas into concrete project plans and implementing them, thereby making full use of your data. 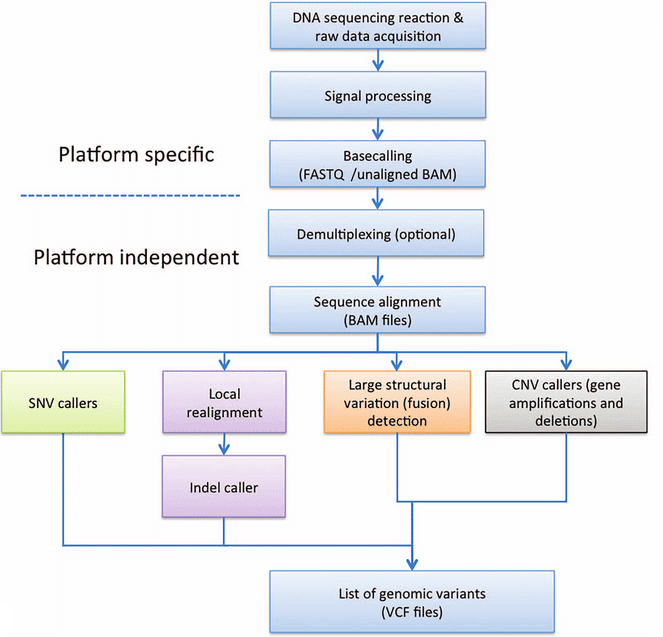 General bioinformatics workflow for NGS data includes base calling (platform specific), demultiplexing (optional), sequence alignment, and variants calling. 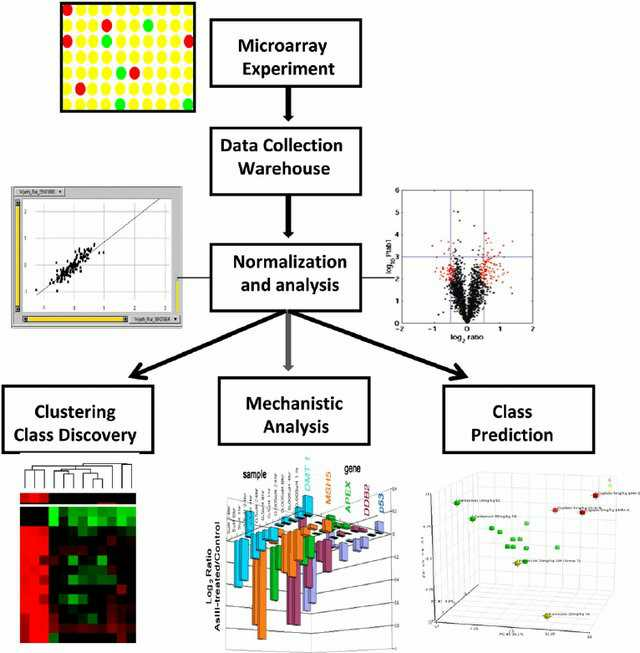 General bioinformatics workflow for microarray data includes data correction for background, normalization, gene expression patterns clustering, class prediction, and biological mechanism prediction. CD Genomics’ bioinformatics services cover a wide range of genomic applications, including genomics, transcriptomics, epigenomics, and microarray. Want more information about our bioinformatics services or interested in bioinformatics analysis of your raw high-throughput sequencing or microarray data? Please feel free to submit a service inquiry. We are here to help! Roy, S.; et al. Next-Generation Sequencing Informatics: Challenges and Strategies for Implementation in a Clinical Environment. Archives of Pathology & Laboratory Medicine, 2016, 140(9), 958–975.